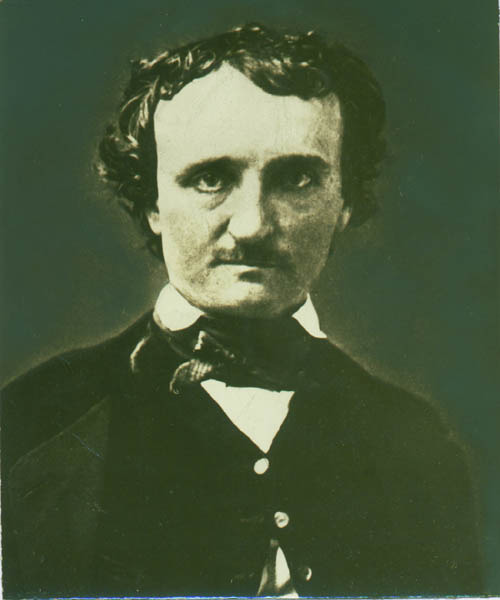 Daguerreotype portrait of Edgar Allan Poe, 1848. Edgar Allan Poe matriculated in February 1826. In May he wrote home to his adopted father, Richmond merchant John Allan, thanking him for clothes and requesting that he send Tacitus's History and some soap. 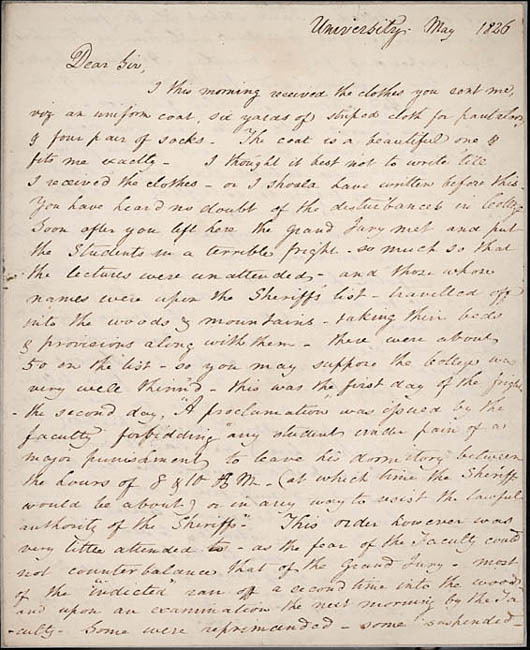 The remainder of the letter describes the recent "disturbances:"
The Grand Jury met and put the students in a terrible fright--so much so that the lectures were unattended--and those whose names were upon the Sheriff's list--travelled off into the woods & mountains--taking their beds & provisions along with them. Following this disturbance, several students were reprimanded or suspended and one was expelled. There have been several fights since you were here--One between Turner Dixon, and [Robert] Blow from Norfolk excited more interest than any I have seen, for a common fight is so trifling an occurrence that no notice is taken of it--Blow got much the advantage in the scuffle--but Dixon posted him in very indecent terms...nothing was talked off [sic] for a week, but Dixon's charge & Blow's explanation--every pillar in the University was white with scratched paper--Dixon made a physical attack upon Arthur Smith...he struck him with a large stone on one side of his head--whereupon Smith drew a pistol (which are all the fashion here) and had it not missed fired--would have put an end to the controversy.